Commencing on the 27 April 1949, France issued the first stamp in what was to become a glorious set of five Airmail stamps, the last of which was issued on 16 January 1950. All of the stamps in this set were designed and engraved by Albert Decaris. This set is known by the name: Aerial Views of France. 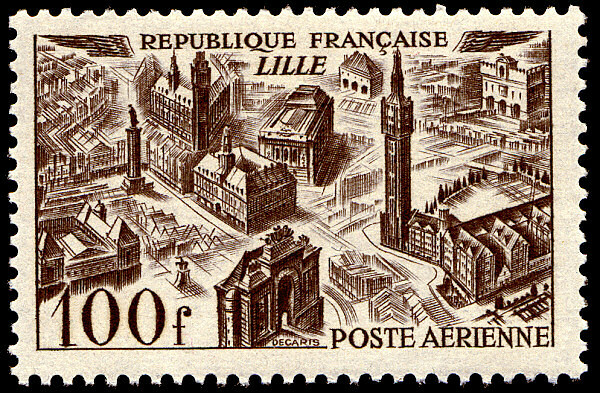 The 100f value, issued 27 April, depicts the city of Lille, France. Lille is located in French Flanders on the Dûele River in the north of France. There is an interesting feature within this stamp worth mentioning. Turn your eye to the middle left of the stamp. You will see a column. This is the Goddess Monument. It commemorates Lille's resistance to the Austrian siege of 1792. Atop the column stands the Goddess. She has in her right hand a a linstock, which was used to light the fuses of cannons. Another interesting feature in the stamp is located in the centre foreground of the stamp. This arched structure is known as the Porte de Paris. This is one of the gates that was originally a part of the ancient wall that surrounded the city. The 200f value, issued 23 June, depicts the city of Bordeaux. Bordeaux is a port city located on the Garonne River in southwestern France. Bordeaux is considered the wine capital of the world. There are a couple of features in this stamp worth highlighting. 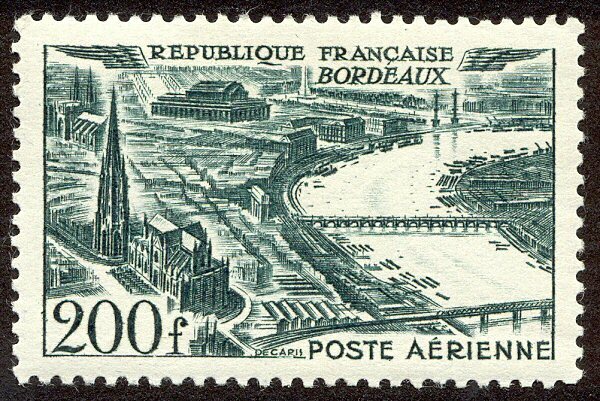 The first is the Gustave Eiffel Railway bridge in the centre of the stamp. And to the left stands St. Michael's church, with the prominent bell-tower known as "The Arrow" reaching toward the sky. 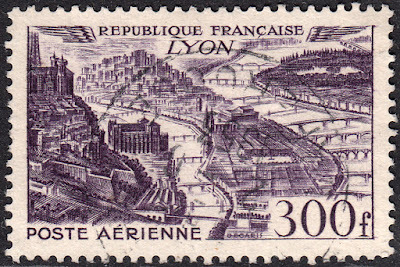 The 300f value, issued 23 June, depicts the city of Lyon. Lyon is located in east-central France in the Auvergne-Rhône-Alps region, between Paris and Marseille. 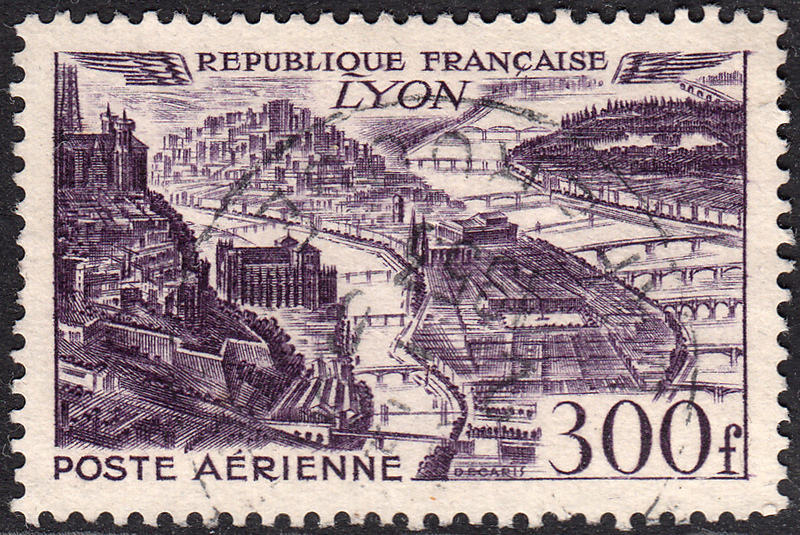 The Rhône and the Saône Rivers snake through the centre of this amazing stamp. The left side of the stamp is dominated by a geographical feature known as "The Hill That Preys". Sitting atop the hill is the Basilica of Notre-Dame de Fouvière. And behind that at the top left is the Tour métallique, a TV tower fashioned to resemble the last stage of the Eiffel Tower. 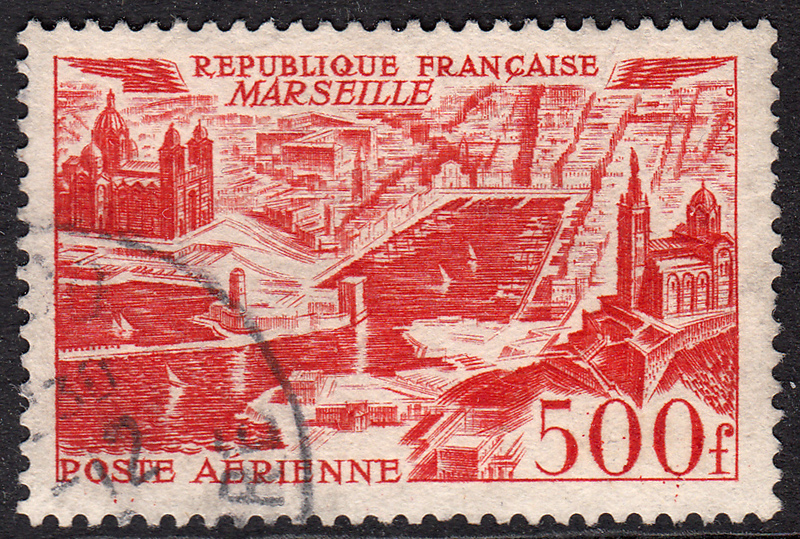 The 500f value, issued 1 July, depicts the city of Marseille. Marseille is located in France's south coast, and is the second largest city in France. The prominent feature of this stamp is the Old Port, which has been the city's natural harbour since around 600 BC when Greek settlers from Phocaea arrived. 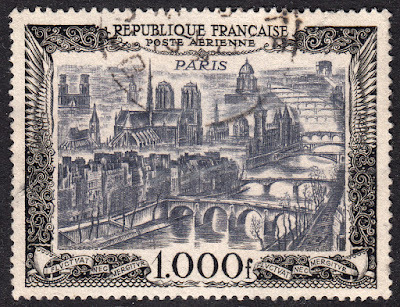 The 1,000f value, issued 16 January 1950, depicts the city of Paris. The capital of France, Paris is located in the north of the country on the River Seine. 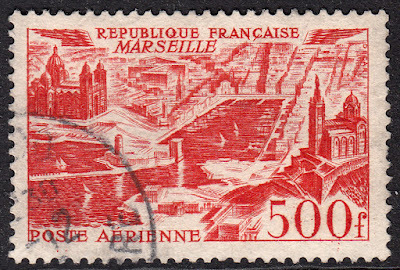 This stamp is the pièce de résistance of the set. It is truly superb! The image is looking west. 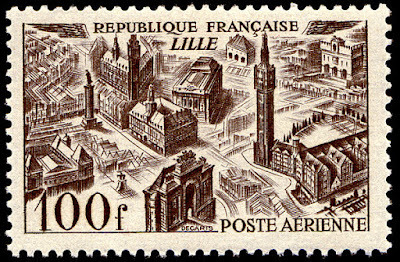 Dominting the centre left of this stamp is Notre Dame Cathedral. Winding through the right of the stamp is the river Seine. 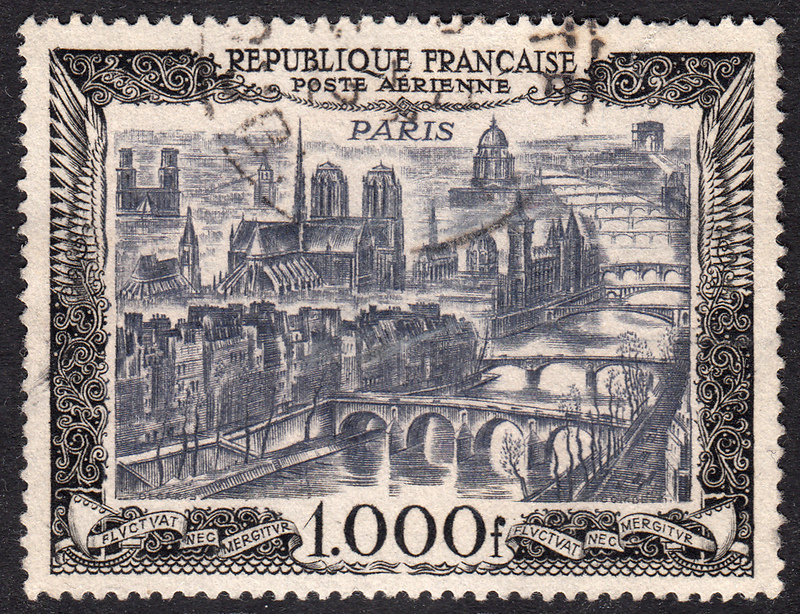 This stamp also highlights some of the many bridges of Paris. While doing research for this blog, I found a great Powerpoint presentation on the net dealing with the bridges of Paris on stamps. Click HERE to look at the presentation. Within that presentation is an image that lists the names of many of the bridges Decaris engraved into the stamp.